When Dorothy clicked the heels of her ruby slippers—or silver, if you’re going by the book—she was magically transported home. When you click the heels of Dominic Wilcox‘s bespoke No Place Like Home shoes, they show you the way home. These handmade leather shoes are outfitted with GPS technology to point you in the right direction and show how much progress you’ve made. This artistic endeavor is a fun combination of wearable technology and beautiful craftsmanship, all to help you correctly navigate to anywhere in the world. Wilcox was commissioned by the Global Footprint project in Northamptonshire to design and create a pair of shoes. Thinking about Dorothy’s famous shoes in the Wizard of Oz that were able to take her back home, Wilcox also wanted to make a pair of shoes that could lead you anywhere you want. He named the shoes, No Place Like Home, and partnered with interactive arts and technology expert Becky Stewart and local Northampton shoe maker Stamp Shoes to make the custom shoes. The two shoes work together to provide information on direction and distance to the wearer. The left shoe is outfitted with GPS technology and a ring of LED lights on the toe, which show which direction the wearer should move. Then the right shoe communicated with the left wirelessly and shows your progress through LEDs also on the toe. Bright red tabs on the heel operate as the antenna to connect with the satellites. To operate the shoes, the wearer simply types in the address via a computer portal and uploads the location to the shoes through a USB connection. After putting the shoes on, the wearer clicks their heels together to turn on the shoes, which will start navigating you to your final destination. Just like Dorothy’s shoes, the No Place Like Home shoes will get you to where you need to be. Although this was just a fun project integrating technology and bespoke fashion, this sort of concept could have real world applications for those with who suffer from terrible navigation skills. When Dorothy clicked the heels of her ruby slippers�or silver, if you're going by the book�she was magically transported home. 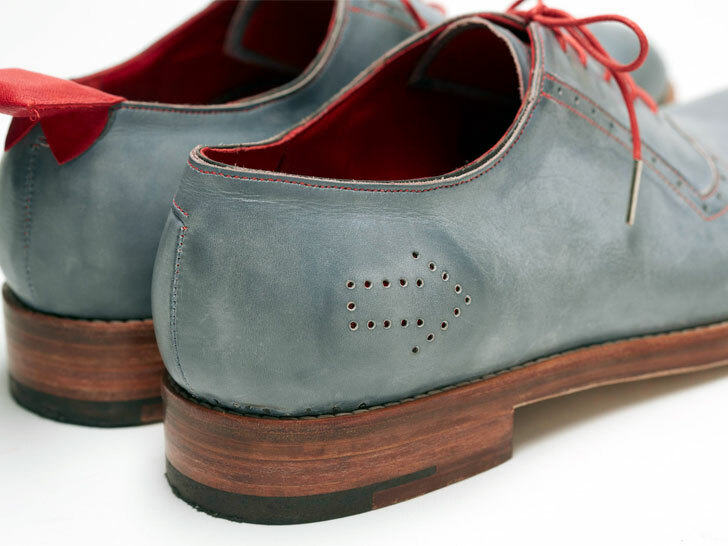 When you click the heels of Dominic Wilcox's bespoke No Place Like Home shoes, they show you the way home. These handmade leather shoes are outfitted with GPS technology to point you in the right direction and show how much progress you've made. This artistic endeavor is a fun combination of wearable technology and beautiful craftsmanship, all to help you correctly navigate to anywhere in the world.